This post will focus on attacking BOB protection when the offense has assigned both inside linebackers to the offensive line. 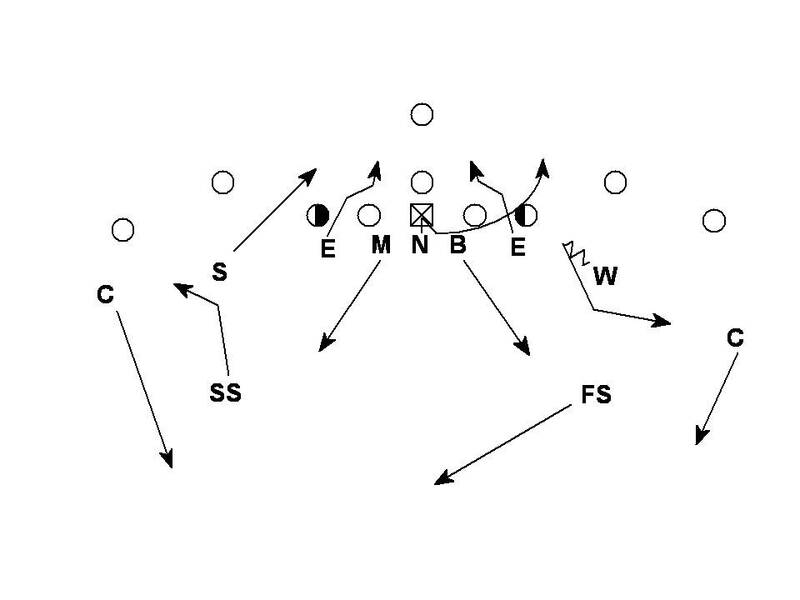 The first and simplest pressure plan vs. this protection is to rush both OLBs. 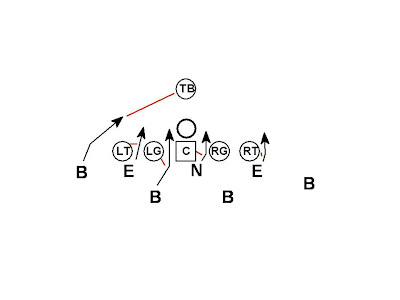 Blitzing both should get the offense to throw hot. 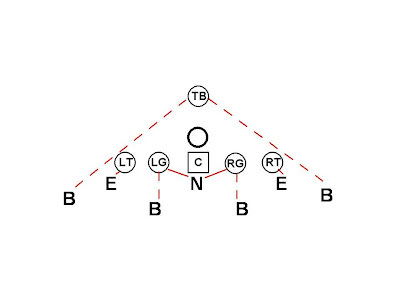 The next strategy to attack this protection is to move 1 or both of the DEs to a 4i (inside shade) alignment on the OT. 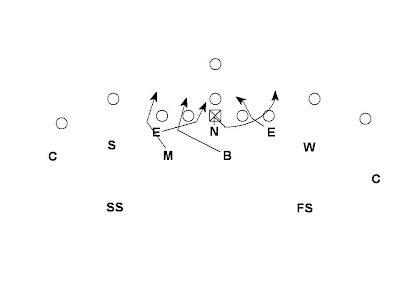 Here the LT has the 4i DE 1 on 1. 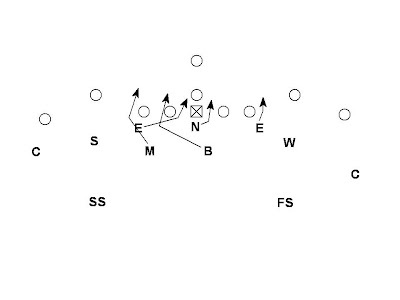 The DE is aligned inside and is on an inside pass rush. 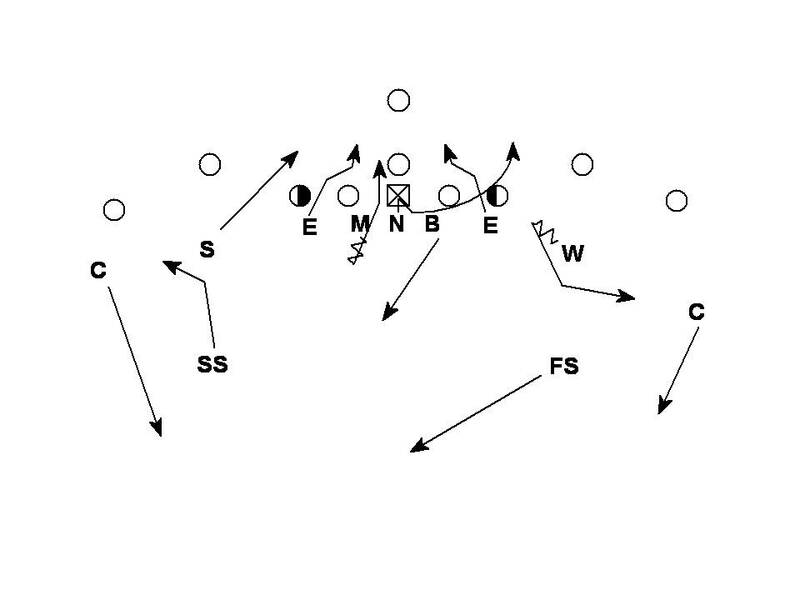 This creates a difficult block for the LT. 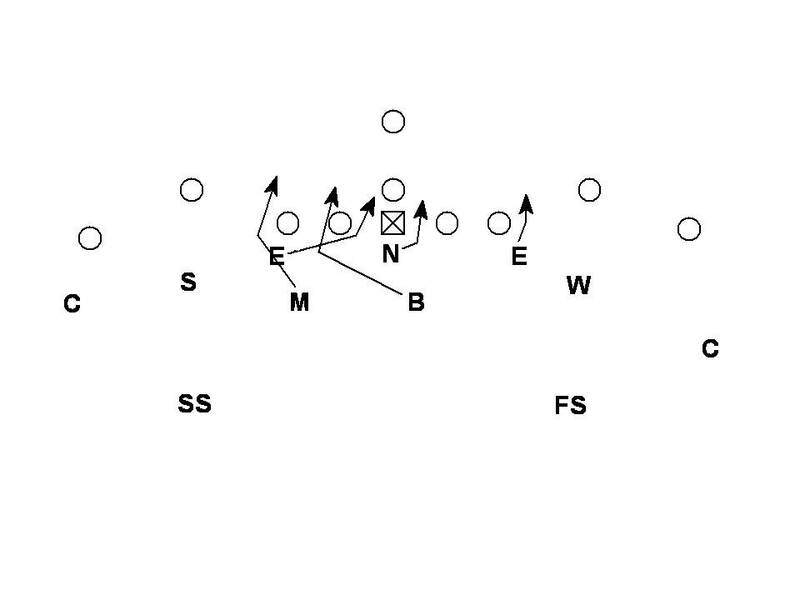 This same pressure can be run as a 4 man rush with the LILB buffing pressure at or near the LOS in the A gap to hold the LG from helping with the 4i DE then bailing to coverage. 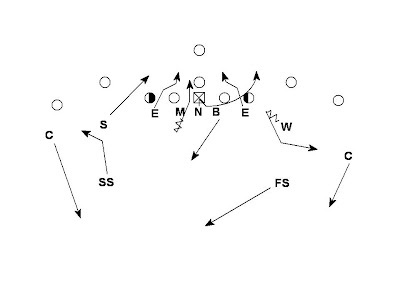 The Mike and Bob bluffing pressure holds the guards long enough for the inside pass rush by the DEs. The Nose jabs and loops for contain. After running this pressure once or twice the guards may decide to help with the Ends quickly as they see the inside backers drop. You can compliment this pressure with a bail and go concept which was previously discussed with video here. The Mike walks up pre-snap to attract the guard's attention. Post-snap the Mike will start to bail then blitz the A gap. 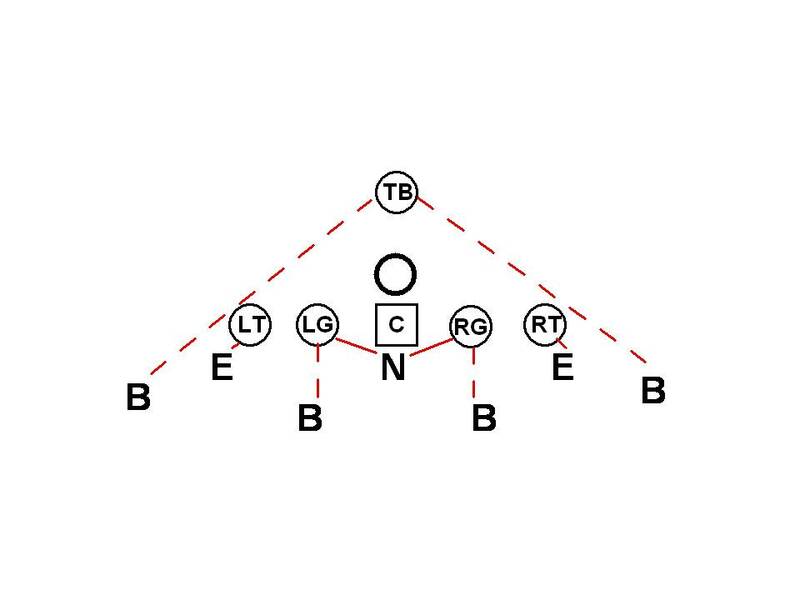 The coverage needs to be adjusted to a 3 under 3 deep because it is now a 5 man pass rush. Another strategy involves using inside linebackers as outside pass rushers. This pressure is just like the traditional NCAA blitz but with the two inside linebackers blitzing instead. The end is long sticking to the A gap. To pick it up the center must pass the Nose to the Guard and pick up the long stick. The guard must pass off the long stick to the center. 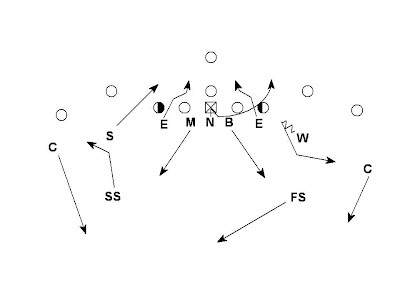 The Tackle must pass off the long stick and pick up the edge blitzer. That is a high degree of difficulty for a single blitz. If the offense is able to pick up this pressure you can increase the degree of difficulty by adding a twist by the Nose and away side DE. 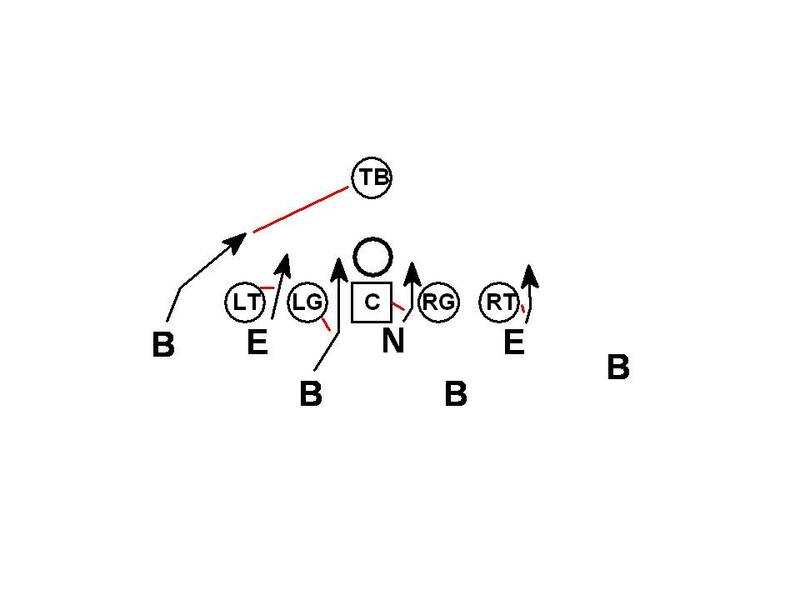 The jab and loop by the Nose helps keep the center from getting involved blitz side and creates a 2 on 1 vs. the guard (long stick and inside blitzer). Meanwhile the away side guard and tackle must handle a twist in man protection which always requires good technique and communication. 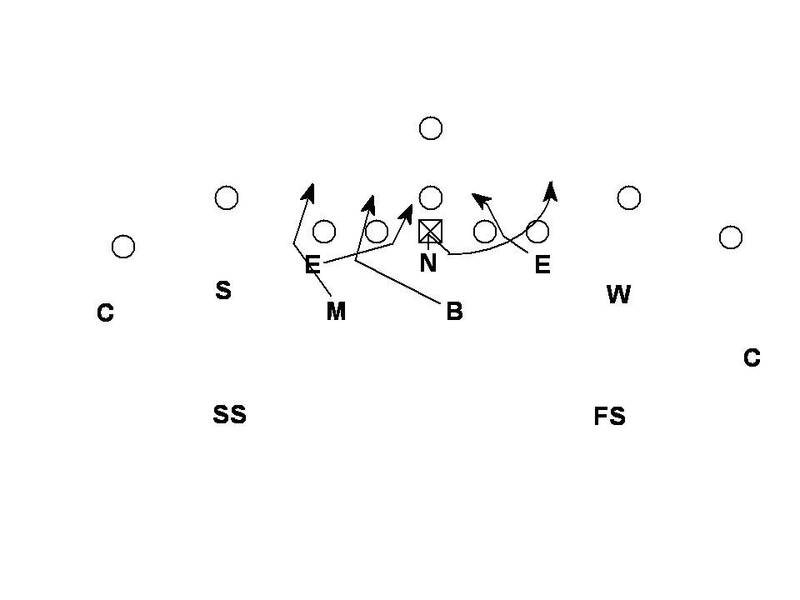 Either of these pressures can be run with a 3 under 3 deep or a 4 under 2 deep coverage behind it. More strategies for attacking BOB protection are on the way in the forthcoming posts.